Loads of obscure recordings including US labels such as Myrrh, Creative Sound, Maranatha, Lamb & Lion, Bridge, Light, Sparrow, Sonrise Mercantile, Destiny, Airborn, Superior, Discovery, GIA, Avant Garde, World Library, FEL, NALR. Also scores of British albums from labels like Myrrh, Grapevine, Dovetail, Reflection, Emblem, Profile, Echo, Genesis, Key, Pilgrim, plus imports from Canada, Australia, Germany and other countries, along with numerous never-before-heard-of custom lps. 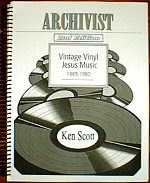 Also a small section on previously unreleased Jesus music available on CD.